July 4th is full of fun, family, and fireworks in my home! Every year we get together, barbeque, listen to fun patriotic music, and prepare ourselves for a spectacular light show from different areas in town. We can usually see 3-4 different shows from wherever we end up and it’s always a blast for the kids. 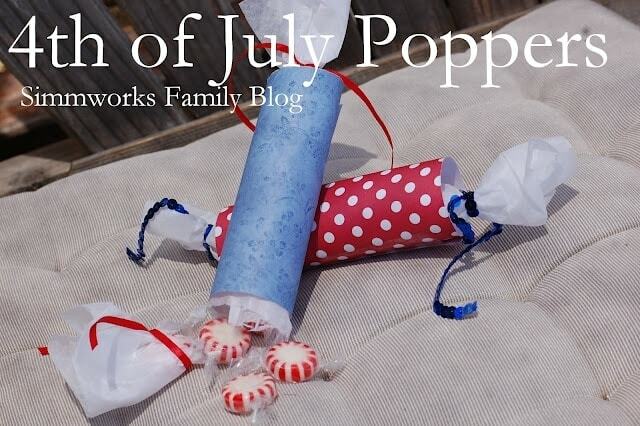 This year I wanted to do something special and make a few treats for everyone so the kids helped me make special 4th of July crafts — poppers with yummy mints and candies inside. We just grab each side of the popper, pull out, and watch the candy scatter everywhere! How fun is that? Want to make some for your 4th of July celebration? Here’s how! 1. Cut tissue paper a little wider than scrapbook paper and place it on the wrong side of the scrapbook paper. 2. Line back of scrapbook paper with tissue paper and roll both together to form a cylinder. Tape shut leaving about 1-2 inches of tissue paper coming out of each side. 3. Tie one end with ribbon to secure shut. 4. Fill cylinder with candy. Make sure to get the candy inside of the tissue paper. 5. Tie other end of cylinder shut to seal in the candy. How simple was that? These poppers take all of 5 minutes to make one (unless the kids are helping… then it might take 30 minutes) and are perfect for any holiday! Have you done any 4th of July Crafts? She loves to blog about her family, healthy living, going green and crafting. Danielle would love for you to come visit! You can reach her on facebook and twitter as well. If you have any questions feel free to email her at simmworksfamily@gmail.com. Those are just adorable! Thanks for sharing! I think these would make great party favors for my daughter’s birthday party! Thanks for the idea! I don’t celebrate July 4th but I can see myself using this for Christmas or New Year’s, thank you for the great idea! We are actually going to have extra kids here for the 4th of July. Maybe I can get them to help make them, too! What a great craft!! My grandson would like helping to make these! I love this craft and cannot wait to adapt it for the holidays. I have enough time to collect the materials and make some for my neighbors class! She teaches 2nd grade and I know the kids will love them! Thank you so much. I just love your craft posts! Those are super cute, thanks for sharing! Hi there to every body, it’s my first pay a quick visit of this webpage; this blog contains awesome and actually excellent data designed for readers. These would be great for a birthday party or a Christmas treat for the kids.